Heartland Black + Gold isclosed for the winter. Usually I'm writing about all the great new restaurants opening in Port Chester and Rye Brook, most recently focusing on Saltaire and Café Mirage. Unfortunately in recent weeks more eateries have closed than opened, a sad sign for what had been a robust restaurant scene regularly experiencing turnover as every community does. I don't know if it's the cold weather or just the normal churn, but it's got me feeling down when a major place like Port Chester Hall & Beer Garden turned Heartland Black + Gold can't make it. After Heartland Holdings invested $6 million in the historic 1890 train station building to transform a structure in dire need of rehabilitation into a cool modern bar and eatery with a heated pavilion and outdoor garden, I had every confidence that it would be a popular gathering spot. And it was for a while. But then it stopped being open for lunch except on Saturday and Sunday, later it closed altogether on Sunday and Monday, and the next thing I knew it was closed for the winter. 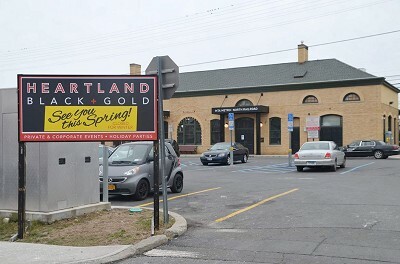 Heartland is supposed to reopen in the spring, according to the sign at the entrance to the commuter lot on Broad Street and on the door of the building, and we've been told they hope to reopen in March, but if that doesn't happen, it will be a huge blow to Port Chester. Especially since it's across the street from my office, I found it a fun place to hang out or to meet people for a drink and a bite to eat and especially loved the casual atmosphere in the spring, summer and fall when the weather was conducive to eating in the pavilion or garden. I even found it exciting sitting in the pavilion during a major rainstorm. It did get a little nippy out there, even in front of the fireplace, in the winter which probably contributed to its unviability this time of year. River House Bar and Grill at 435-7 North Main St. closed suddenly a few weeks ago after going downhill over the 15 months it was open. It started out like gangbusters with a great executive chef and menu, but the chef didn't last long and even their steak sandwich I had raved about in my initial review suffered to the point where I stopped ordering it. Only the freshly made $5 margaritas and variety of excellent tacos on Taco Thursdays and the fact that River House served food late into the night remained reasons to frequent the once-promising bar and grill. That spot and other bar/restaurants on Main Street hurt from the "no parking" restriction after 1 a.m. which should be done away with or modified by the Port Chester Board of Trustees. It was instituted when there were several rowdy bars on North Main, but that hasn't been the case for many years now, so why not do everything to help businesses rather than hurt them. It's bad enough for restaurants that there is paid parking until 9 p.m.
Keylee's Restaurant at 11 Pearl St., one of only two Guatemalan restaurants in Port Chester, closed a month or two ago when the building it was in was vacated to make way for parking to accommodate the new office building with ground floor restaurant under construction across the way at 10 Pearl St. where Rye Town Hall used to stand. That building will be coming down within the next few weeks, according to Brett Neri at Neri's Bakery Products. The expected completion date for the new structure is May or June. 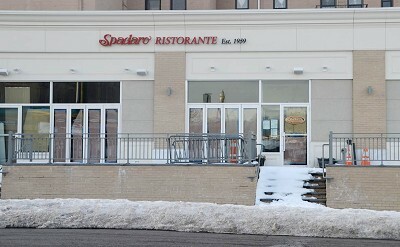 Add to these Panera Bread which did not renew its lease in the Waterfront at Port Chester development and moved out in October 2015, Applebee's which closed there in April 2014 and the former Arrosto on South Regent Street, which has been dark for a year now, and the local restaurant picture starts to look rather gloomy. On the brighter side, D'Onofrio's Pizza & Pasta at 199 South Regent St. has changed its name to Regent Pizza & Pasta and is under new management. In addition, Panka Peruvian Bistro has finally opened at 167 Westchester Ave. and is definitely worth a try. It's directly across from the St. Peter's Church parking lot entrance. More on these two in the next few months. Although it is a long time coming, Patsy's Pizzeria of New York City fame is still in the midst of refurbishing the location where Spadaro Ristorante had been in Neil Pagano's newly renovated building on Abendroth Avenue. According to the building permit that was taken out in July 2015, alterations will include relocating the existing bar, creating a service counter and changing the entrance on the North Main Street side of the restaurant. "They are making good headway," said former Mayor Pagano on Tuesday, Jan. 26. "They've got at least another month's worth of work." He predicted a spring opening. Finally, it's unclear what's happening with the former Modern Shade and Awning/water company building on Willett Avenue across from The Mariner apartment building and Saltaire where renovations had started and then abruptly stopped in mid-2015. I know the American Bar & Restaurant group had gotten approval for a good-sized restaurant and deck at that location but am not sure when work will be starting up there again. There will always be restaurants closing down and the reasons are very simple. I order to sustain business you need a high volume of traffic aka New York City where you have tons of taxi cabs, busses and trains and subways and flights from several huge airports. Many people who do not need to park a car and many people who work in the city and eat lunch & dinner out. Huge numbers of people living in the city who can afford to dine out frequently. Unlike Port Chester where the residents are mainly low income and the village cannot sustain heavy traffic because most of the people drive and have no place to park. Add the booting situation which is another large turnoff. This is why Port Chester will never be able to sustain a large number of restaurants.. The reasons are very obvious. This comment has been hidden due to low approval.